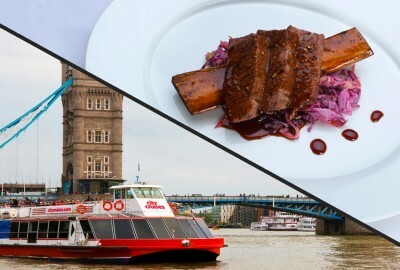 Enjoy an unforgettable day out in London with this unique experience featuring a Thames Hop-On Hop-Off River Cruise and a three-course meal for two at one of London Steakhouse Co's restaurants in City or Chelsea. Discover the sights and history of London from the Thames on this leisurely cruise. With your 24-hour pass, enjoy unobstructed views of the city’s main riverside attractions like the London Eye and the Houses of Parliament from within an all-weather vessel, and hop on or off at any stop along the way. As part of this sensational experience, you’ll also be welcomed into one of the award-winning London Steakhouse Co restaurants for a delicious three-course meal with a cocktail each. Sit back and relax as you peruse the mouth-watering set menu, available for lunch or dinner, featuring a selection of tasty appetisers, high-quality steaks, roast meats, fish, and timeless puddings. It’s up to you to choose whether you embark on your hop-on hop-off cruise before or after your meal and either way, you’re sure to enjoy a day out to remember with this magnificent experience for two. When you call our reservation team, we will book your visit on the Thames cruise and your meal at the London Steakhouse Co at the same time. The Thames Hop-On Hop-Off Cruise includes a relaxing boat trip down the Thames with options to enjoy the views from the open upper deck or the lower saloon. A live commentary is also available onboard. The cruise departs from all the following piers at different times throughout the day: Westminster Pier, Waterloo Pier, Tower Pier, & Greenwich Pier. Throughout the hour long cruise, you and your guest will have the opportunity to access many attractions, including the Tower of London, Houses of Parliament, London Eye and Greenwich. Please Note: You must exchange your voucher for tickets at a City Cruises ticket office (located at Westminster, Tower and Greenwich piers) before participating in the activity. You can then travel to and from London Eye pier after your vouchers have been exchanged. The cruise runs every 40 minutes. Last times shown are the latest embarkation times for the full round trip. The London Steakhouse Co dining experience is for two people to dine from a 3 course set menu. There are at least four options at each course. An 8oz House cut steak is included in the price as one of the main courses - other cuts are available at a supplement. Side orders are not included and may be required with steaks although there are always at least two options that do not require a side order. Both of our restaurants are easy to get to from the various piers that the cruise departs from. London Steakhouse Co - Chelsea is just a 20minute taxi ride from Waterloo Pier. London Steakhouse Co - City is just an18 minute walk away from Tower Pier. We operate a 48 Hour Cancellation policy on our dining experiences . Experiences cancelled within 48 hours of the reserved time may not be used again.